I’ve just come back from Delhi. I left on the brink of mad depression and returned somewhat happy. It’s seems to be pattern that has developed over the last few years, going mad at work and recovering on some out of the country mission. This time the mission involved shopping for my wedding in April. And now I am all kitted out! I’m happy because I discovered Krishnamurti whilst in our Friends house in Delhi. I read a book of his over my three day stay there and weirdly things are starting to make sense. It all started about a week and a half ago when I met a upcoming gentleman who had been sent to one of Krishnamurti’s schools when he was a young boy. The situation he described to me was very interesting and it drew parallels to some of my experiences during the Hoffman course. It’s about connecting with other human beings and connecting with yourself, Krishnamurti, seems to have built this factor into a schooling process. Which is rather fascinating. So whilst in Delhi, in boutique after boutique, I got my dose of Krishnamurti. So what’s new with this gentleman, what can he teach you and why should you care? Well one. I don’t know if it is for everyone. A lot of what he writes requires a certain amount of pre-experience, of which we all have some, but have you ever connected with your experience, have you ever connected with your rage, with your depression, with your joy? Or do you just sweep them aside. Have you ever felt like death, death from shame, death from anger, death from Joy? A lot of what he writes directly coincides with our ability to face ourselves directly, without shying away. Like when you look at someone unfriendly in the eyes, that urge to disconnect, that discomfort, to face it, to embrace it, this is the philosophy of krishnamurti. So, a lot of what he says has to do with you, with your experience, not with theories about what experience is. There is nothing new in this. Every half decent experiential philosophy describes exactly that, this is what Zen, Budhism, Hinduism,Christianity, Yogic traditions, Mysticism, etc.. all preach about. Hundreds of gurus, thousands of books, millions of methods, all about this. 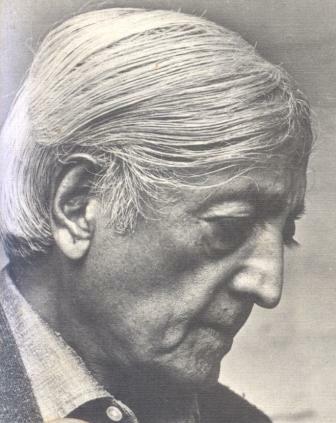 So why Krishnamurti? His first advice. Ditch them all, say no to all forms of authority. Do not follow! Second. It is your experience that you need to dive into. Find your motives, be in your reactions, examine your mind, moment to moment, but don’t abstract. Don’t try to classify, ‘this is anger’ and ‘this is annoyed’ etc… just be with the emotion. third. Know that ultimately there is no final answer. That deep feeling within you. (you know what I am talking about) it’s going to be there forever. The trick is to be with it not escape it, which is what we all do. And that’s whole lot of Krishnamurti. Basically screw them all and know it that you’re, you’re on your own now!